On Sunday night I realised that I was rather bored of being a Skyrim widow, so when a friend of mine texted saying she was bored, happily headed over to her flat for some company. While she made cinnamon buns, I browsed one of the Nigella Lawson cookbooks that she had, and was inspired to make a healthy midweek supper. Not the most wintery of recipes, but I had a couple of avocadoes that needed eating and have been craving fresh greens. Sadly I had to make do with pre-cooked frozen king prawns, but if you can get your hands on them, I'd recommend using raw ones if you can as these shrank significantly when I fried them with the garlic. The dressing is wonderfully light and zingy and the wasabi, mirin and rice vinegar add a deliciously Japanese twist. It is also virtually fat-free, which helps counterbalance the avocadoes a little! Deseed and finely chop the chilli, place in a bowl or jar, and add the mirin, wasabi, rice vinegar, sesame oil, salt and lime juice. beat or shake well until all the ingredients are combined. Plunge the fine beans into boiling water and cook for 4-5 minutes until al dente, then plunge into ice cold water and drain. Peel and slice the avocado, and arrange on two plates with the salad and beans. Add a little oil to a frying pan, and when almost smoking hot, add the raw prawns and garlic. Fry until pink, then divide between the two plates. Finally, drizzle the dressing over the two salads and serve while the prawns are still warm. A perfect quick and easy weeknight supper on the table in 20 minutes! damn! Not quite the same, but if you've got olive oil, mustard and vinegar, a french dressing would also be nice! 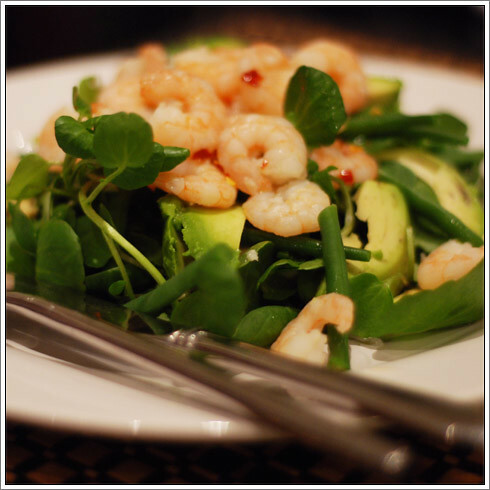 Prawns and avocado are a match made in heaven, and with the Japanese twist on your dressing this salad looks gorgeous. I make a Skye Gingell salad dressing for crab with mirin and wasabi which is gorgeous - imagine this tastes as good, if not better! Oh, tell me about it! It's one of those combinations that I could happily eat for ever. That Skye Gingell recipe sounds lovely too - the Nigella one had crayfish too, which I expect works even better with the mirin & wasabi dressing. Will have to investigate!